The dynamic intersections of auto-rickshaws, pedestrians, and overflowing public buses on Kolkata streets/ high-energy drumming during the festival of goddess Durga/ long lines of political processions obstructing traffic for hours/ the fragrance of jasmine flowers tangled in hair after rehearsal/ heated political arguments inside coffeeshops, shape my work, bringing tension and angularity to my practice of flow. Like those streets, where a multinational bank stands beside a small, broken-down shrine and women’s groups perform street theater at the bus stop outside my guru’s classical dance studio, my urban aesthetic is imbued with spiritual possibilities, and my work is in dialogue with the secular and the political. My commitment to choreographing women’s stories and themes of social justice took form as I walked the protest-rich streets of Kolkata, hearing, in memory, my mother’s songs about the dreams she longed to have fulfilled. This dense landscape, whose rhythms and quick turns of events contest each other, where one’s journeys are filled with sweat, resignation, and grit, is my experience of urbanity. This way of knowing the world, typical of the postcolonial global south, is embedded in my consciousness, and fractures the classical rhythms and idealized harmony in which I was trained. And so, in some ways, my current work is very different from my beginnings as a classical dancer, an exponent of Odissi. From a different perspective, my work today is integrally connected to the core philosophy of those traditional practices. Caught between the beauty of the classical dance and the urgency of street theater of which I was part, I left my path as Odissi dancer in search of dance that could speak to my realities. But my experiences had crafted my consciousness in important ways: I became an unwavering teller of women’s stories. One day, in rehearsal for a classical piece about the divine lovers, Radha and Krishna, we were waiting for one of the lead dancers. When she finally stumbled into rehearsal, she was black and blue, assaulted by a husband jealous of the publicity she was receiving. Stunned, I asked Guruji how she could dance about romantic love when she had just experienced its failure. Guruji’s response was non-committal: In the classical world, we dance the ideal. Since then, and through time, my commitment has been to telling the stories of everyday women in their daily lives, stories of struggle, resilience, and courage. Yet, as I crafted Yorchha™, my new language of contemporary Indian dance, I realized that while I wanted to move away from a classical worldview, static notions of tradition, and depictions of women as goddesses, mothers, or lovers, my classical training offered a powerful beginning for creating a contemporary dance vocabulary that located the movement aesthetic in my specific cultural context. Yorchha™ is marked by an interweaving of the upper body spirals and curvilinear balances of the Odissi, the breath flow and spinal extensions of vinyasa yoga, and the hip shifts and pelvic floor extensions of Chhau. 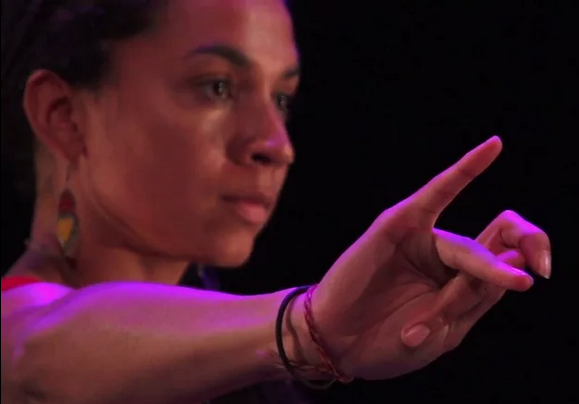 The remix and dialogue of these movement principles creates a contemporary dance language rooted in indigenous concepts of the body, feminist and feminine at the same time. Training in Indian dance generally does not include overt instruction in choreography; thus, I spent many years identifying the principles that had been used to create traditional repertoire. Researching the way my guru’s guru created and taught new pieces as part of the 1960’s revival of Odissi, I realized that a core principle is the invocation of a layered emotional landscape. My work reimagines and extends the choreographic methodology of such expressive abhinaya pieces, juxtaposing multiple metaphoric non-linear narratives to suggest the complexity of human experience. Marked by emotional landscapes unfolding through rhythmic structures, my choreography riffs off of classical time cycles to hit jagged beats and unevenly juxtaposed time signatures. The interrupted phrasings that organize my choreography, through footwork, breath, and internal vibration, articulate an urban contemporary landscape and the philosophy of Shawngram™, struggle and resistance as an active daily force, at the core of my work. In the dances I make, Shawngram™ articulates confrontation, devastation, and trauma in stories about the fight for justice. 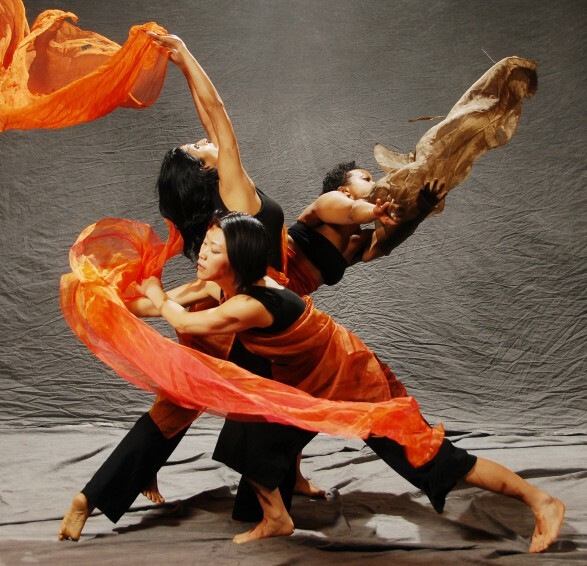 It leads me to search for moments of ensemble work, women dancing together, emanating power through their footwork. Shawngram™ infuses my work with a spirit of determination, where women from global communities of color battle barriers in their lives with courage. Yorchha™ embodies this aspiration and struggle, refusing idealized beauty, refracting traditional vocabularies, and intersecting their movement principles in unusual ways to create complex expressive possibilities. The intersection of the technique of Yorchha™ with the philosophy of Shawngram™ creates dancing that is infused with desire for beauty and justice. This I describe as Aanch, heat. Heat flows in the directed energy of dancing to audiences, calling them into the work. 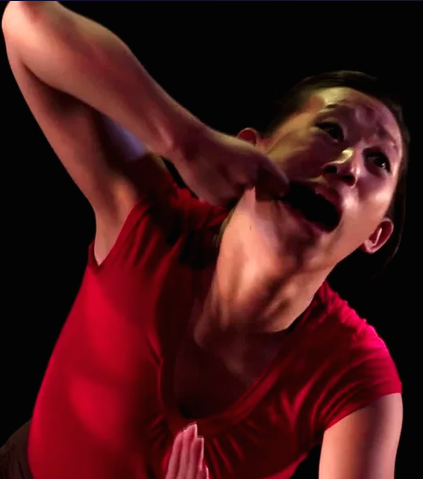 This call to action, Daak, is always part of my choreography, where audiences are invited to move with the dancers in structured participatory experiences. Such moments, where different bodies with different histories share dancing and negotiate their paths amid strangers, affirm my belief in dance’s power to move hearts and build community. 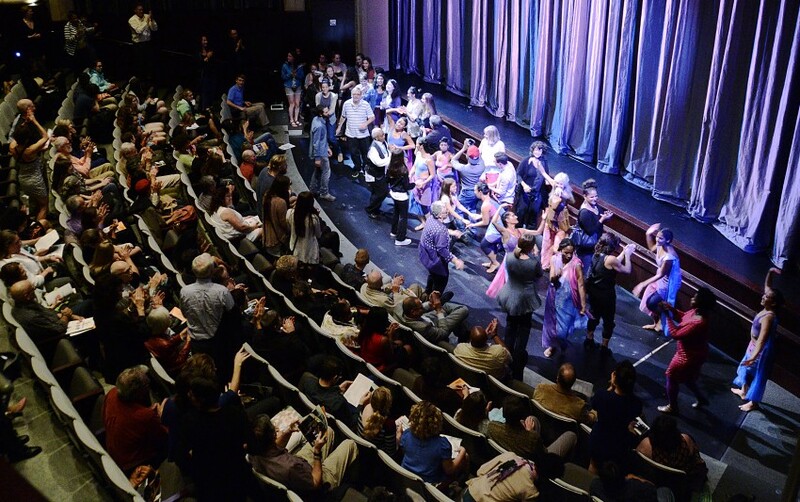 Leading audiences into making movement meaningful and connected to their lives is my practice of #occupydance. In concert experiences, I invite audiences to join the performers at specific moments, with simple gestural language, in the hope that it remains within the muscle memory of audiences, sparking questions later on. Differently, my “performance installations” are built on the premise of audience interaction. The space is choreographed very particularly, audiences are given clear directions, which they might interpret in different ways, and my dancers must improvise within the movement aesthetic and intention, while responding to audiences. This work has been more difficult to document because of media permissions and the interruptions that happen when cameras enter the thick of people dancing. My evening-length works are built through the exploration of a social justice theme. The creative process is initiated by research and conversations with leaders from global women of color communities, which creates space for sharing stories and movement. These #Spinespin conversations spark the choreographic process and build alliances with the broader community of women who I invite into my work. My work often juxtaposes contesting narratives to unravel themes. These stories are partly remembered, partly researched, and mostly imagined. 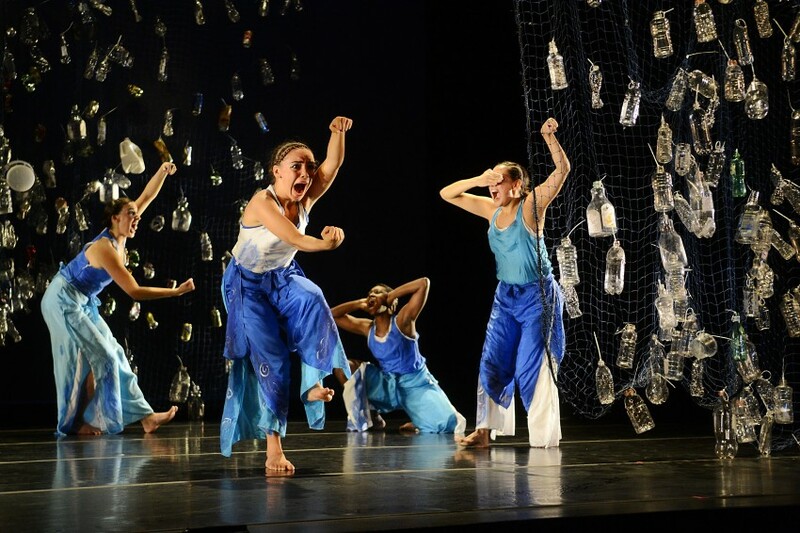 I define my dancers as cultural activists and encourage them to develop ownership of the stories, perform them with power, and see themselves as crucial agents of research and community engagement. 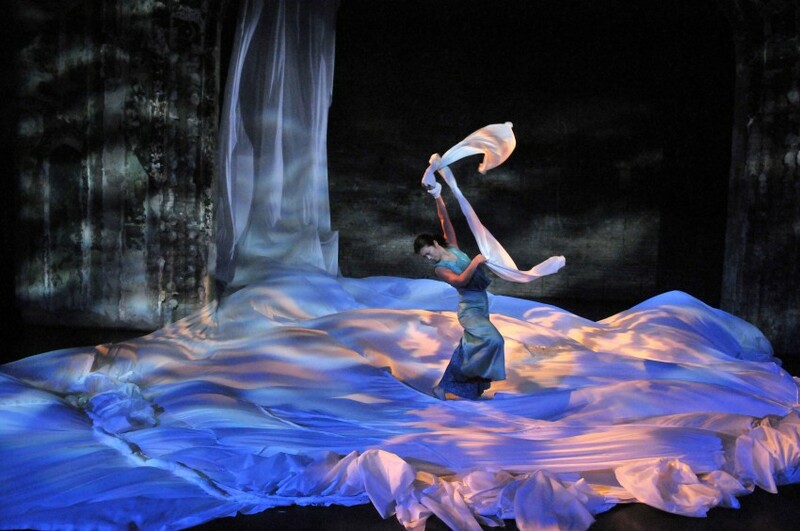 The creative process includes dialogues, workshops and rigorous rehearsal, quickening the relationships among dancers. Dancing together while celebrating our differences is vital and nuanced labor and reminds us of our shared beliefs and the real possibility of transformation. Because my dances tell stories of an ensemble of women who come from “everywhere and nowhere at the same time,” and are as much about individual as community experiences, ensemble work embedded with individual voices is vital in my choreography. Dancing together and performing unison choreography are important values in the work, as are respect for different approaches to the material, different body types, and different backgrounds of the dancers. This difference-in-togetherness principle also supports the multiple narratives that often run parallel, merge, or comment upon each other in the choreography. My works seldom reside in a settled sense of happiness or beauty. Rather, their structures are infused with a spirit of resilience where dancers fail, suffer losses, fall to the ground again and again, are repeatedly reborn, and re-commit to life-forces, building energy and rumblings of change. This spirit leads me to multi-year works, where I invest in understanding the multiple aspects of an issue over time. This sustained, embodied investigation is my way of celebrating and archiving little known histories of women of color.